Imagine living through a childhood undetachable to bitterness and coldness; imagine becoming the burial objects of your parent’s indifference. Stitches is a graphic novel written and illustrated by the American author David Small. 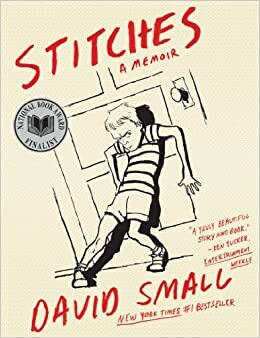 For Small, Stitches carries a meaning that is much superior than a graphic novel, for, as a memoir, it is a recount of his childhood. The main character, David, is a child who grows up in an unusual family of four with his brother, mother, and father in the city of Detroit. As a consequence of his mother’s innate mental unstableness, a sensation of tension and uneasiness have always encircled the Small family. David’s father is a surgeon who spends most of his time in the hospital, thus rarely communicates with his family. David is the exception in his family; unlike his psychotic parents, he is extremely talented. However, his talents have never been rewarded for, because they have been buried under resentment of his family. As a result, David internalized all of his anxiousness, anger, and hope. The artwork, plot, and themes are the best part of this novel. It may usually seem too difficult to depict characters and a plot rich in emotions with only white and black in its illustrations, but David Small mastered his work. This graphic novel is powerful enough to tug at the reader’s heartstrings with each illustration. I have never struggled with understanding any illustrations in this graphic novel for it is portrayed in a detailed yet organized manner. David masters the usage of splash pages, spread, and bleed to dramatically portray the character’s emotional stage, and transits between reality and the main character’s surreal imaginations. The theme of this graphic novel, such as transformation, suffering, and family brings the graphic novel to another level. As the story is being told through first person perspective, it leads the audience to evaluate on essential elements of life such as suffering through the main character’s eyes. The themes of this graphic novel is profound in its meaning, and portrayed in a way that strikes the audiences to think when reading. The plot of this graphic novel can also be considered as extraordinary. The twists and turns in the graphic novel grabs the readers by the throat, and carries the readers through the story in a very fast pace. The experiences of the main character seem so surreal and cruel, but at the same time, so true, and heart breaking. The novel’s biggest weakness is its dialogue. There are very few dialogues in each panel, and fails to fully develop each character. The characters often “speaks” with very short and incomplete phrases, making the conversations very curt, and not as satisfying when reading. This graphic novel would appeal more to older teenagers and adults, because the illustrations are slightly inappropriate for children while the themes embodies various philosophical understandings on life, which is also harder for younger audiences to understand and relate to. This graphic novel could definitely be considered as literature. It is the embodiment of artistically compelling illustrations and a summarizing, yet extremely sophisticated story line. Stitches not only tells the life story of David Small, but also by depicting the desperation of a child suffering in an unfortunate family. Stitches is a truly brilliant graphic novel that is worthwhile for a reader to investment his time in.